For 1 cup:100mls red wine, 50mls orange juice, 50mls apple juice, 1 pump cinnamon syrup, splash simple syrup, 4-5 pieces cloves, Heat on stovetop, garnish with chopped orange slices. We serve this (to much acclaim) in my restaurant. 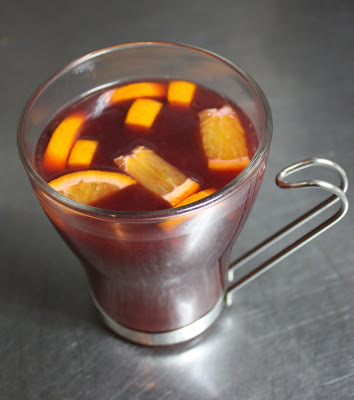 Do you make mulled wine at home? Share your secrets in the thread.